Home > Supplements for Children > Do My Children Need Supplements? We all want to do the best for our children, and many people believe that entails giving them regular vitamins to enhance their diets. After all, we reason, why not make sure they have the very best, which includes giving them the very best start in life? Most health professionals agree that normal, healthy children with well-balanced diets have no need for supplements, as they should be getting all the vitamins and minerals they need from their regular meals. Children who are very picky eaters, however, might be missing out, and there are some supplements which both parents and health professionals alike say might do some good – and certainly no harm if doses are administered correctly. If you feel that your child may be missing out on something essential to his or her good health, it’s best to consult with your GP and ascertain whether or not this is really the case before giving supplements. Vitamin D: Studies have shown that children do not get enough vitamin D, which we mainly get through exposure to natural sunlight. Supplements are recommended by many people, but not all. Fluoride: Most drinking water contains fluoride, which is enough for the teeth of both growing children and adults. Ask your dentist if you are worried. Fish oil: Many parents these days give their children fish oil, which contains omega-3 fatty acids, to boost their children’s brainpower. Giving them several servings of oily fish a week could have the same effect. Vitamin C: Often children who seem to come down with a lot of colds are given vitamin C in an attempt to boost their immune system. Eating citrus fruit could have the same effect, and also give much-needed fibre to a diet. When it comes to supplements, it’s entirely untrue that you can’t have too much of a good thing. Some supplements can actually have a detrimental effect on health when taken in very large doses. In fact, they can actually be toxic in the body. These include vitamins D and A, so follow the recommended instructions and never take matters into your own hands. In fact, if you are considering taking supplements of any kind – and/or giving them to your children, in particular – you should always consult with your GP or a medical professional first. Some supplements can interact with each other and with prescribed medication, and be downright dangerous. Also, never rely on supplements to make up for foods your child should be eating – but isn’t. You get a lot more from a healthy diet than simply vitamins and minerals, and encouraging good eating habits from birth will help set up a child for life. Remember, some of the foods your children are already eating – such as some infant formulas, milk, margarine and cereals – are already fortified with essential vitamins and minerals. 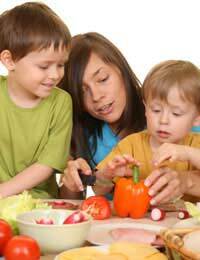 Eating healthily is one way you can ensure your children get the right nutrition they or she needs. If you are concerned they are not getting enough, speak to your doctor.